Ah Springtime! Warm days, cool nights. Daffodils and forsythia blooming. March Madness (college basketball). Termites swarming! Daylight Saving Time. What was that?… Termites swarming? Every year about this time swarms of fluttering insects can be seen pouring out of a crack in the soil, or from the base of a tree or branch, or just flying through one’s yard. What we’re seeing is the reproductive stage of the Eastern subterranean termite, Reticulitermes flavipes (there are two other species that are not as widespread). 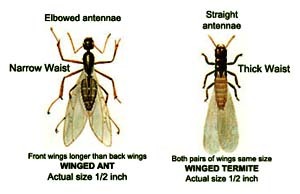 What are the differences between flying termites and flying ants? As mentioned earlier, the winged forms are the reproductive adults, on their nuptial flight, leaving their home colony and searching for a home they can begin to call their own. A male and female are attracted to each other during the flight, drop to the ground and mate. After mating, both sexes lose their wings and begin actively searching for an underground site with a suitable food source such as a tree root, a firewood pile or discarded lumber in contact with the ground. Discarded wood sources that have been buried are often utilized. Unlike bees, where the male dies after mating, a termite couple known as a king and queen can live for years, producing thousands of offspring. Most of the offspring are workers. They are sterile, wingless and tend to the welfare of the colony and search for food. This is the stage that most often attacks a home. Subterranean termites need a constantly moist environment and must be in contact with the ground to avoid desiccation. As the workers forage for food they construct tunnels made of wood and soil. One sure sign of a home invasion is the presence of mud tunnels on the house foundation extending from the ground upward toward the house. Often the tunnels are not obvious. If a homeowner spots these mud tunnels or suspects he or she may have termites, it is time to contact a reputable pest control company to conduct an annual termite inspection for damage. If damage is detected, a treatment program should be started, requiring a trench to be dug around the foundation and a chemical barrier applied. Do-it-yourself remedies will not work! One-time pest control service or recurring pest control services, we can tailor a pest control program that will suite your specific needs!